In One Day . 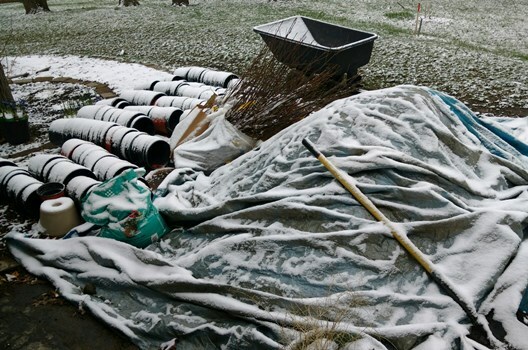 . .
After a really cold start with snow on the ground and trees shivering in their storage bags, a courageous group of volunteers put in over 28 hours of work the weekend of April 7 successfully potting 231 native Ohio trees and shrubs. And that was just Saturday. On Sunday, three volunteers planted 13 of the trees in the Foster area at the 37.5 mile mark to add another 6 hours of volunteer time. Trees and shrubs had been obtained as bare root stock from the Warren County Soil and Water Conservation District on Friday afternoon. With all the hard work, everyone warmed up such that it turned into a glorious day to pot up a new forest. Given the diversity of soil structure in the park that ranges from deep humic-rich soil to pure clay to railroad rock rubble, we have tried various potting mixtures over the years. Plants were potted this year in a mixture of equal portions of topsoil, leaf mulch, pine fines, and Michigan peat. Volunteers included Rick Forrester, John Telintelo, Holly King, Phil Wolf, Jean Henderson, Patti Prince, Kevin Brown, and Mark Frietch. 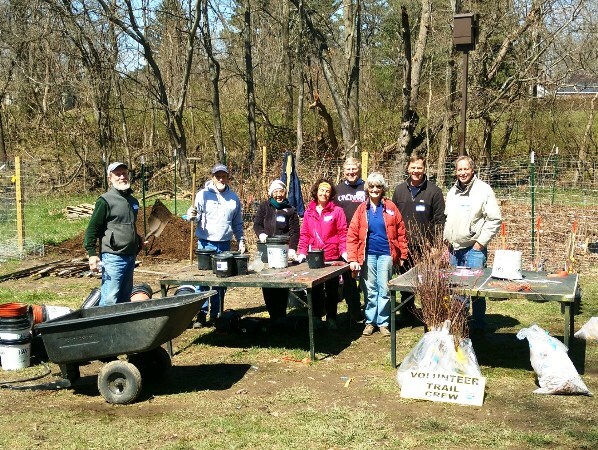 We also had the first-time pleasure of working with members from the Ohio Valley Forestry Fellowship (Bob Reckers, Tom Boeing, and Nicole Henger). 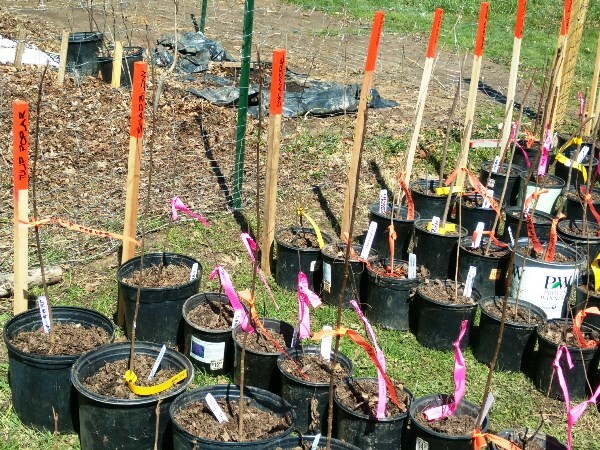 OVFF is a non-profit organization that has distributed over 300,000 trees across the tri-state area since 1979. Trees will be logged with the Taking Root initiative as they are planted throughout the year. 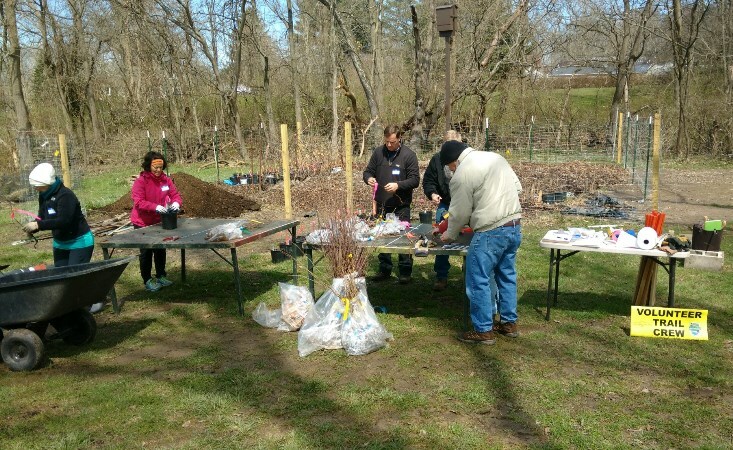 Taking Root's goal is to plant 2 million trees, one tree for each of the inhabitants of the Cincinnati, southeast Indiana, and northern Kentucky tri-state area. Thanks to all the volunteers this weekend to help make 2018 the best tree year in FLMSP history!